In order for us to better serve our interest owners, we have answered some of the frequently asked questions regarding changes in current ownership of mineral interests. If you do require any additional information, please contact us. To access current and past year’s tax forms please login using the link below. 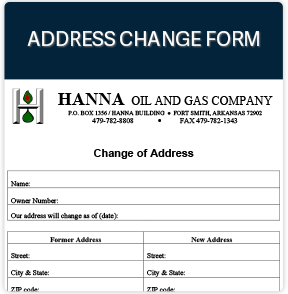 You should notify our office via this form as soon as possible when your mailing address changes. Please sign the form and include your owner number for verification purposes. You may send it back to us by email, fax, or mail. For your protection our office will not accept address changes by telephone. Is direct deposit available? How do I sign up? Yes, direct deposit is available. This letter will tell you about our direct deposit offering and help answer any questions you may have. 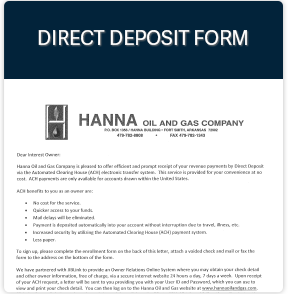 To sign up for direct deposit complete this form and send back to us by email, fax, or mail. What do I provide to have an interest transferred to me? For a full or partial conveyance of a mineral, royalty, overriding royalty or working interest, furnish a copy of the conveyance document recorded in the county and state where the interest is located. How do I deal with legal name changes? When an individual’s name changes because of marriage, divorce, etc., please furnish our office with a copy of the document evidencing the name change. How do I update ownership changes due to divorce? Our office will need a copy of the Final Divorce Decree and copies of recorded conveyances. When an owner is declared incompetent, please furnish Letters of Guardianship issued by the local court. Furnish a copy of the death certificate and the current address/social security number of the new owner. When an owner of a life estate interest dies, our office will need a copy of the death certificate and the names, addresses and social security numbers (if available) of the persons who own the Remainder and who succeed to the interest. In some instances, we will need further information including a copy of the documents which originally create the life tenancy and named the successors. We can accept an unrecorded Power of Attorney for changes of address; however, if you are selling a mineral interest as someone’s attorney-in-fact, you will need to record the Power of Attorney in the county and state where the mineral interest is located. Title to real property owned by the deceased party passes in one of two ways – either by testate succession or by intestate succession. Testate succession is with a probated Last Will and Testament. This Last Will and Testament must be probated in the state where the mineral interest is located to be recognized. Intestate succession is without a will. In the absence of a Will, or if the Will has not been probated in the state where the mineral interest is located, title to real property passes according to the Laws of Descent and Distribution for the State in which the wells/minerals are located, and not the state of residence. Heirship Affidavit – Call our office and we will provide the form and instructions for completion. Please login using the link below. If you don’t already have an account with EnergyLink, please register a new account by clicking the “Need a User ID?” link below.